A mosaic of images collected by MESSENGER as it departed Mercury on October 6, 2008. The Wide Angle Camera on MESSENGER imaged the surface through 11 color filters ranging in wavelength from 430 to 1020 nm. This false-color image reflects various wavelengths of light reflecting from the surface. New observations from NASA's MESSENGER spacecraft revealabout 30 percent of the planet Mercury that has never been seen up closebefore. A giant crater and evidence of ancient volcanoes are among thefindings. The photos show a giant impact crater that spans a lengthequivalent to the distance between Washington, D.C., and Boston. MESSENGER (MErcury Surface, Space ENvironment, GEochemistry,and Ranging spacecraft) made its second close-approach flyby of Mercury inOctober 2008, after being launched in 2004. The spacecraft is thefirst to visit the diminutive planet since the Mariner 10 spacecraft'ssojourn in the 1970s. Until recently, scientists say the closestplanet to the sun remained the least understood of the four terrestrialplanets ? Mercury, Venus, Earth and Mars. For a long time it was thought to bevery similar to Earth's moon in composition, since both worlds have a similargray, pockmarked appearance. The new observations reveal that Mercury's crust was largelycreated through volcanism, with past volcanoes spitting out lava that spreadand dried on the surface. In contrast, volcanism is thought to have played lessof a role in formingthe moon's crust. "Volcanism was a really important process on Mercury, whichis pretty exciting because before MESSENGER's flybys of Mercury we were reallynot even sure that volcanismexisted on Mercury," said Brett Denevi, a postdoctoral researcher inthe School of Earth and Space Exploration at Arizona State University. Deneviis lead author of a paper in the May 1 issue of the journal Sciencedescribing MESSENGER's new global map of Mercury. In fact, Mercury's surface now appears to be more similar tothat of Mars than of the moon. The newly-discovered gigantic crater, called Rembrandt,stretches more than 700 kilometers (430 miles) in diameter. 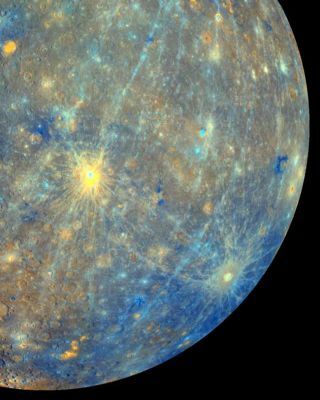 The bowl-likeindentation in Mercury's surface was likely formed about 3.9 billion years agoby an impacting space rock. It has managed to survive with parts of itsoriginal floor still intact, without being filled in by later flows of volcaniclava, as most craters have been. "This is the first time we have seen terrain exposed onthe floor of an impact basin on Mercury that is preserved from when itformed," said Thomas Watters of the Center for Earth and Planetary Studiesat the Smithsonian's National Air and Space Museum, lead author of a paperdescribing the crater in the same issue of Science. "Terrain likethis is usually completely buried by volcanic flows." The crater's floor reveals important details about Mercury'shistory, including multiple stages of volcanic and tectonic activity thatoccurred over time. "This is really exciting because this pattern oftectonic landforms is unlike any we've seen in any other impact basin in thecentral solar system," Watters said. The second MESSENGER flyby uncovered new chemicals inMercury's tenuous atmosphere, including magnesium, which was not previouslyknown to exist there. The discovery confirms that magnesium is an importantconstituent of Mercury's surface. Understanding the different elements presenton Mercury helps scientists reconstruct the planet's history and its formation. During the spacecraft's second close approach to Mercury, italso measured a much more dynamic magnetic field around the planet than wasseen during the first flyby. These changes in magnetic field are tied to thepowerful radiation streaming off the nearby sun, and drive variability in Mercury'satmosphere. Researchers hope that even more secrets of Mercury will berevealed this fall, when MESSENGER makes its third and final flyby of theplanet before setting into orbit around it.